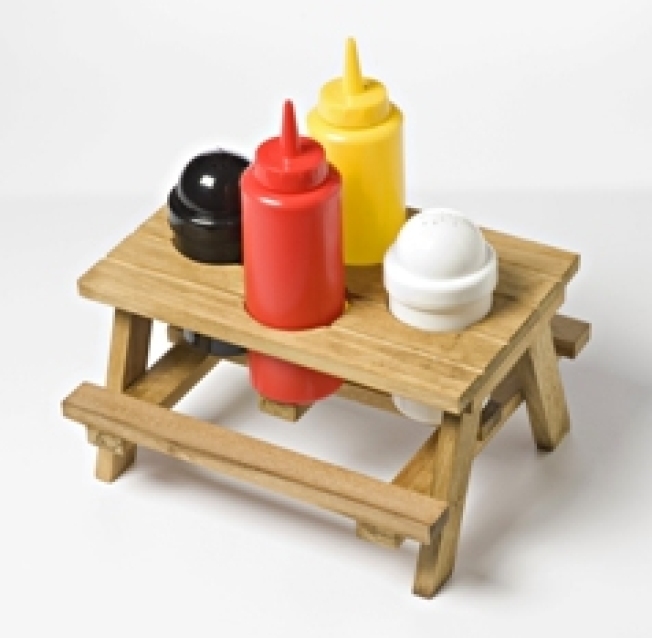 A picnic table for your picnic table, with condiments included. Don't even think about buying dear old Dad another tie for Father's Day. Seriously – he could make a tacky quilt out of the entire collection you've provided him with over the years, and then some. And how many cufflinks, cigars and wallets does a man need? Not one more. Let's go for a little creativity and thoughtfulness this year. Luckily the Museum of Contemporary Art is ready with some totally unique gift options that will impress even the most finicky of fathers this June 21. For the barbecue-ing pop, surprise him with the picnic table condiment set, designed by Kara Orr and packaged in a cute red-and-white checkered gift box ($19.50). For the beer lover, there's the “hopside down glass,” a handblown bottle inside a glass for a whimsical spin on your typical glass of beer. Designed by Dima Komissarov; $20 per glass. Finally, for the artistic daddy-o, spring for the Pantone mug set, a 10-piece collection of ceramic mugs, in the following colors: Red 186C, Spearmint 3395C, Royal Blue 286C, Lime Green 388C, Pale Blue 549C, Lilac 2583C, Olive Green 5757C, Black 4C, Orange 021C and Process Yellow C. ($125 for the set). Buy online or stop by the museum at 220 East Chicago Ave. 312-280-2660.